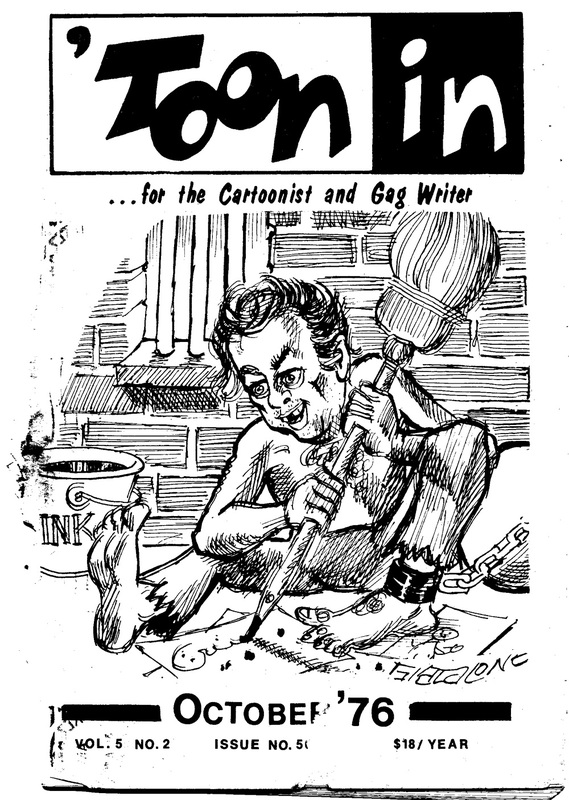 Cartoonist information newsletter ‘Toon In‘ was a well known monthly publication that cartoonists and gag writers subscribed to. It was one of many that were available and these were published by either gag writers or those who were interested in magazine cartooning themselves. The cartoonist information newsletter I’m profiling here was published by gag cartoonist Paul Swan out of Dallas, Texas. Paul’s modus operandi was simple, fill the mails with as many cartoons as humanly possible and sit back and watch the sales roll in. Ok, not really. Paul had a great business sense I adopted early on, after reading another in-depth article he contributed to a cartoonist ‘How To” booklet that advised tips and techniques on how to draw a sellable gag panel cartoon and submit your work to various magazines. 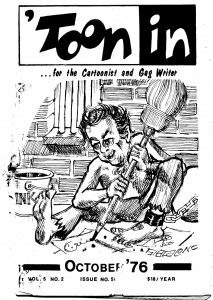 Paul was one of several full time freelance cartoonists who were getting their gag panel cartoons published on a consistent basis and in those days, were not afraid to share and trade information like what ‘Toon In’ provided. Note the cover of this particular issue is from October 1976 was illustrated by Giacalone. The quick back story on Joe Giacalone was he was incarcerated at the time, and doing his sentence in Michigan’s Marquette branch prison which is probably how Joe perceived himself as to how he’s drawn in this cartoon. I’m not certain of his actual crime, but I know there was a syndicate family (no, not cartoon related syndicate!) in Detroit and often wonder if he was related. In an ironic twist, I was given this issue by a well known gag cartoonist of that time named ‘Razor”. His work was appearing in literally dozens of trade magazines throughout the country. 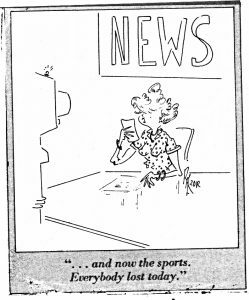 And in fact, Razor wrote a monthly column for Paul’s Toon In called ‘Razor’s Edge’ where he extolled sale upon sale to so many unusual and unknown publications. I mentioned an “ironic twist”, because Razor was incarcerated at the same prison at that time. I won’t mention his name since that isn’t the point to this post, but he was sentenced over what was a “passion killing’ and I’m not certain of the entire story, except to say he discovered his girl with another guy. I lost track of Razor after his release from prison and never saw his cartoons ever appearing in any magazines, and had never kept in touch with him after his release. Suffice it to say, he may have been too busy catching up on lost time. Mind you, these kinds of publications were the go-to resources for information and I tried to subscribe to them all. Even in the 1970’s alot of magazines paid decent rates for single panel cartoons. 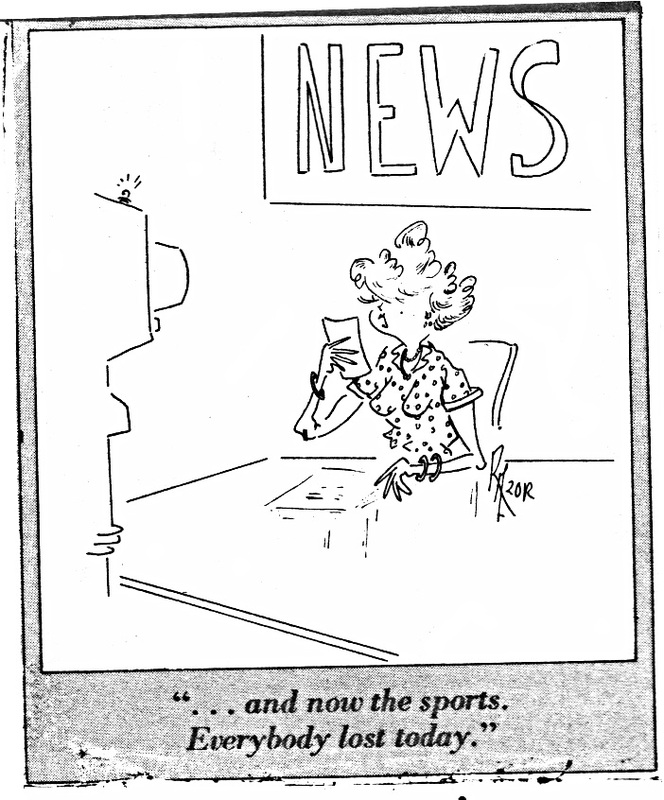 Oddly, the cartoon of Razor’s I show here, was published in a national magazine which was distributed by Ford Motors to customers and employees and they paid a decent rate of $150 per cartoon – back then. I liked this simple line art style of Razor’s that was done in pen & ink and probably took only 10 minutes to draw. I always classified his drawing style as “cerebral”. It must have worked because I saw his stuff in alot of magazines including large circulation publications. Now these days, publications like Cartoon World, Toon In, Funny Papers are considered ancient. The internet allows publishers to email subscribers their issues, like Van Scott does with the cartoonist and gag writer newsletter Gag Recap. Around the middle of each month, the publication is sent via email in PDF format. 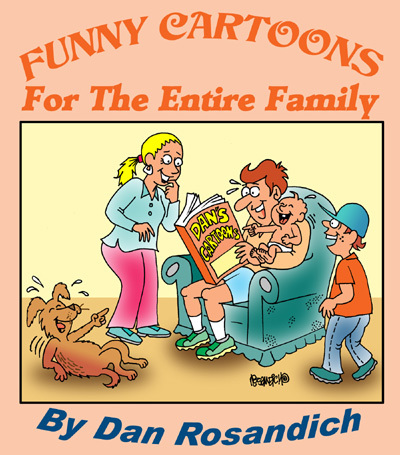 Maybe in the future as publishers and cartoonists alike grow weary of the web and digital technology, a new resurgence of these cartoonist information newsletters will become popular again.Although to be honest, I really don’t see it!